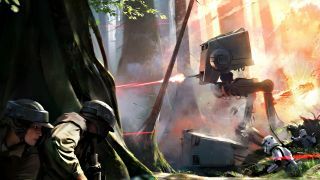 We can't think of a game we're more eager to play right now than Star Wars Battlefront, but there might be bad news ahead if you're a PS4 owner. Xbox Marketing manager Aaron Greenberg has strongly hinted on Twitter that the game will launch earlier in the Xbox One via EA Access. Access is currently only available on the Xbox One, and gives users access to certain titles five days ahead of general release. Unfortunately it doesn't look like EA Access will launch on the PlayStation 4 any time soon. So for the time being, Xboxers will be the first ones returning to the Star Wars universe. We're chasing this up with Microsoft now for confirmation.